All our cakes a baked fresh to order using the best quality ingredients. You can choose from a range of different flavours, please look at the cake flavours page. 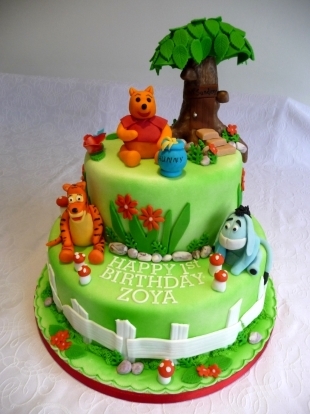 The most popular flavours for children's cakes are vanilla madeira sponge cake with jam and buttercream filling and chocolate cake with buttercream filling. We make all the favourite characters including Frozen, In the night garden, Shrek, Cinderella, Cars, Thomas Tank, Spongebob, Mr Tumble, Lazy Town, Hello Kitty, Peppa Pig, Tom and Jerry and many more. You can see some of the cakes we have made in the Children's cake gallery. 10% discount on your cake when you order your party food. Special dietary needs, including gluten free, egg free and dairy free can be accommodated. All cakes are prepared in an environment where nuts, gluten, eggs and dairy are used. Therefore we cannot guarantee nut, gluten, egg and dairy free. Please note: We sometimes use a piece of dry spaghetti for support in sugar figures.